This fall, my husband Brian and a fine group of other manly men got a moose on their annual hunting trip in interior Alaska. Brian took home the shank bones with meat (front legs, from the knee to the ankle). 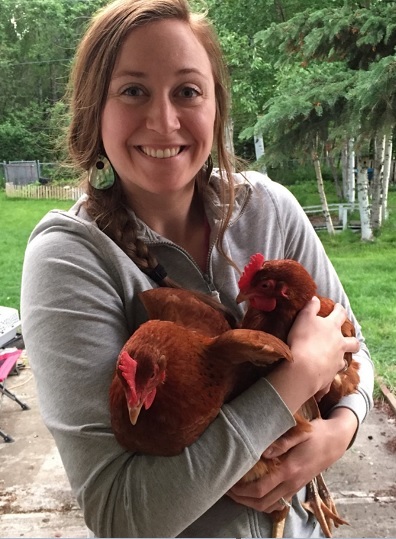 He froze them solid, then found a wild game processor in Anchorage with an excellent meat band saw (= bone cutting machine). The butcher cut the shanks into about 1 1/2-inch thick, bone-in slices for us. We vacuum sealed them once we got home. 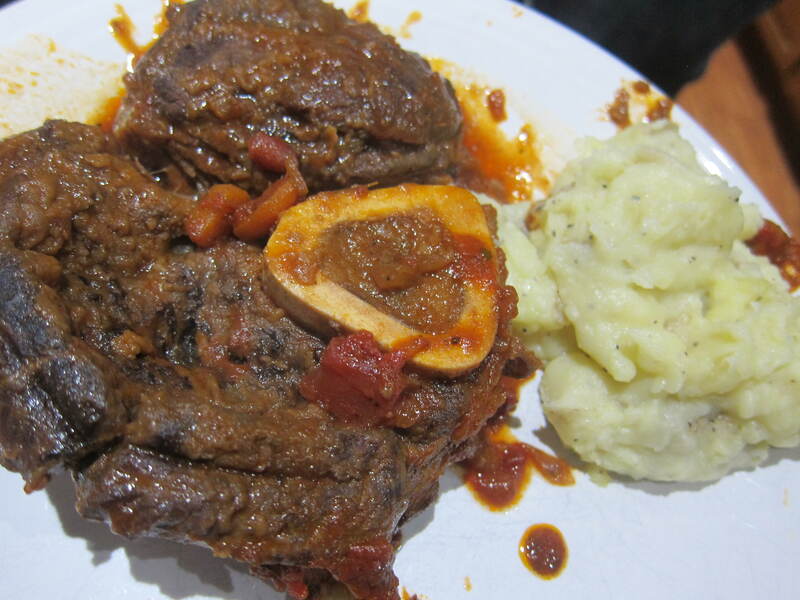 Brian thawed 2 shank steaks, then proceeded to make us an incredible dinner – osso buco with moose shanks. 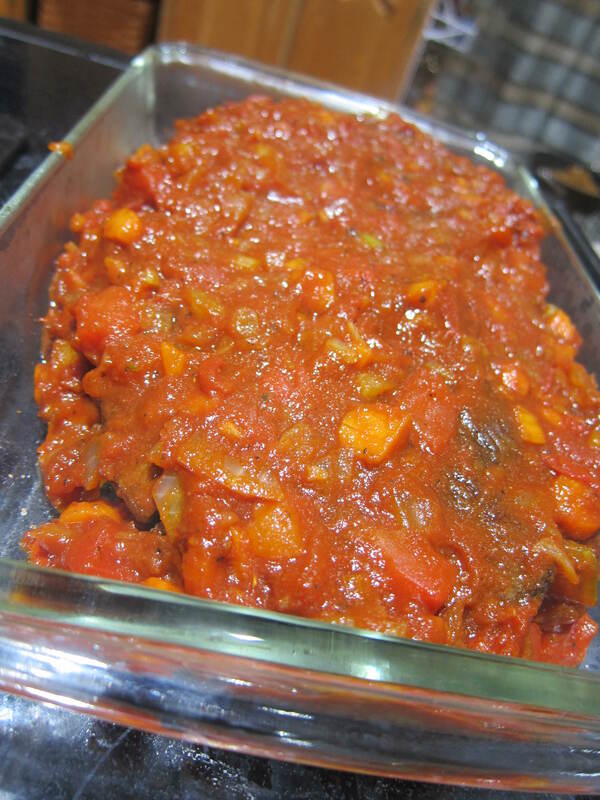 Osso buco is an Italian dish with shank meat and diced vegetables in a wine and tomato sauce. It’s traditionally made with veal shank. Brian used this recipe from FineCooking.com as a loose guideline, then ran with the idea. He started by tying string around the edges of the steak to hold it all together during the preparation, otherwise the bone starts to come loose from the meat. Then he floured the meat and pan fried it for a few minutes, just until the outside turned brown. 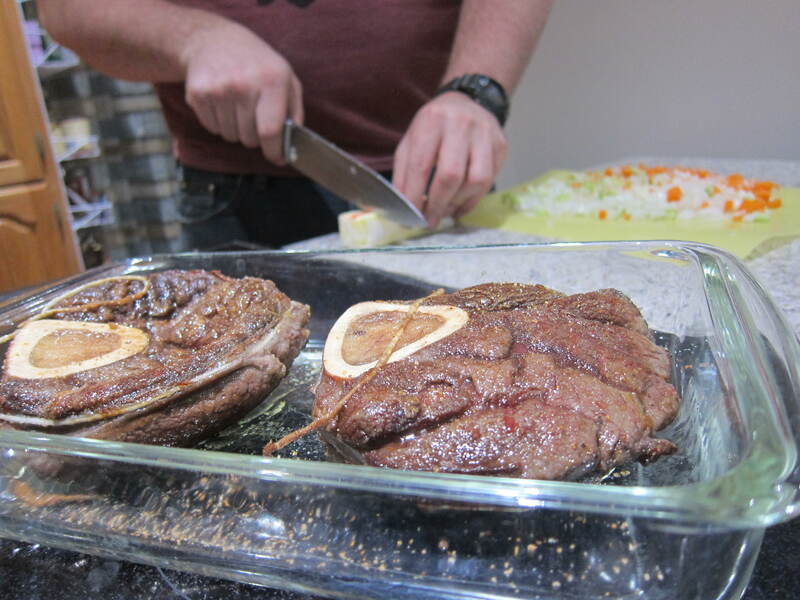 After the moose shank steaks were browned, he put them in a glass baking dish and diced the vegetables – celery, onions and carrots. He sauteed the celery, onions and carrots in the same pan he used to brown the shank steaks. 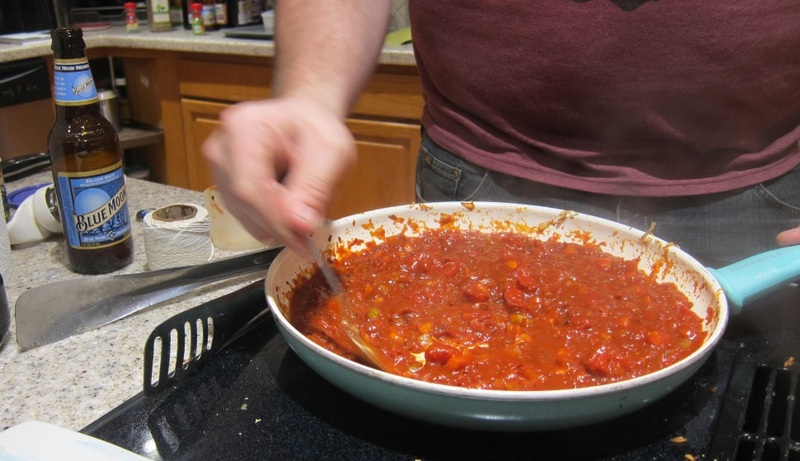 Once the vegetables were tender, he added salt, pepper, oregano, canned diced tomatoes, tomato paste and about half a bottle of Blue Moon beer, an unfiltered Belgian-white wheat style ale. The recipe called for dry white wine, but we’re not dry white wine drinkers. He used what we had on hand, which is plenty of beer. 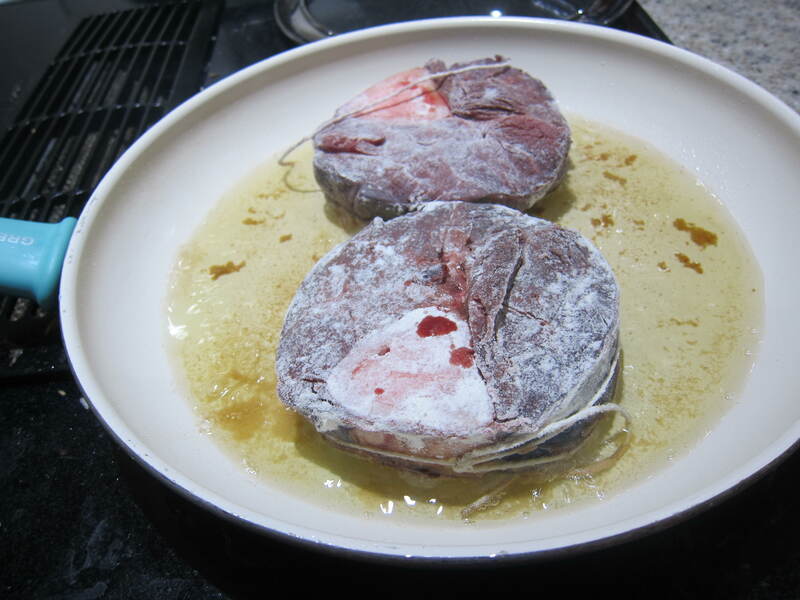 After simmering the sauce down a bit, he poured the vegetable sauce over the shank steaks in the glass pan, then covered it all with tinfoil and popped it in the oven at 350F. He checked on it about every 30 minutes, making sure there was still plenty of moisture in the pan, occasionally adding an extra splash of water or Blue Moon. After about 90 minutes of covered baking, dinner was ready. He pulled off the strings that held the meat together, and plated it with mashed potatoes. The meat was fall-apart tender, and extremely moist; it was hearty yet delicate, with really amazing flavor. The most interesting/unique part of the meal was the bone marrow. Brian referred to the marrow as “moose scallop,” because once you ran your knife around the inside of the shank bone to pop out the marrow, the nugget of marrow looked just like a scallop. It had strangely comparable texture and flavor of a scallop, too. I didn’t grow up eating wild game, muchless eating the marrow out of bones, so that part of the meal was emotionally overwhelming for me. I tasted it, though, and the flavor was wonderful. I just need to work on overcoming my mental block for next time. After watching the meat go from being an entire moose leg to osso buco on my plate, it was an unbelievable transformation. Chef Brian nailed it. It was a culinary masterpiece – something I’d definitely order in a restaurant. 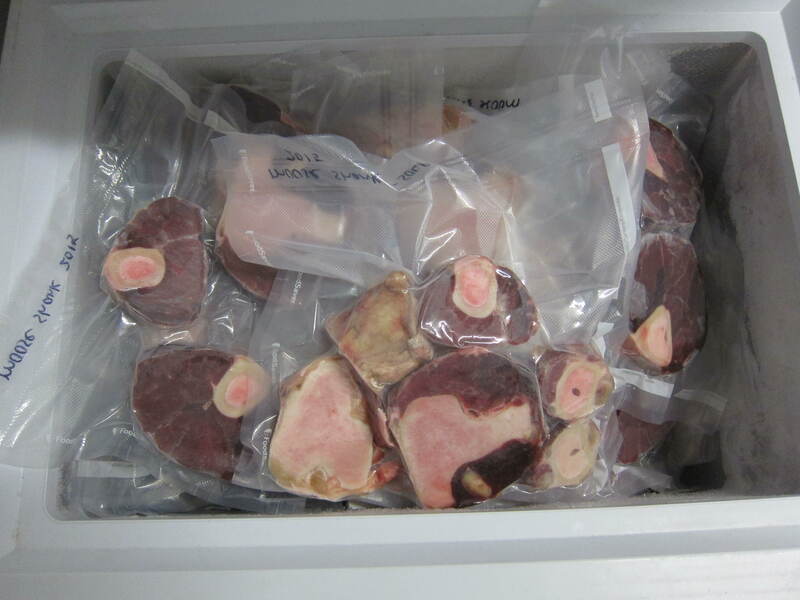 I’m glad we have more moose shank steaks in the freezer!